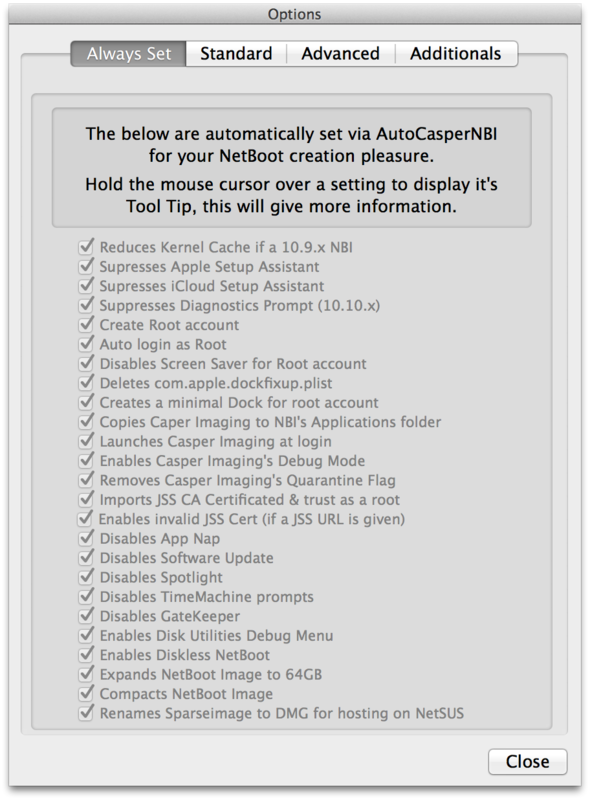 AutoCasperNBI is an app that automates the creation of NetBoot Images (read: NBI’s) for use with Casper Imaging. AutoCasperNBI is designed to cut down on the faff associated with creating NBI’s, by not only by allowing you to create NBI’s on a different OS version. But by also saving your settings for when you next run the tool. This page is the help guide for AutoCasperNBI. To download the latest version of the app & to view the source, click the button below. Or via Boot Picker which is accessed by holding the Option key on startup. This can be tested by creating a vanilla NetBoot Image via System Image Utility, once created upload it to your NetBoot server of choice. NBI’s created with AutoCasperNBI really should be created from a clean never booted Operating System disk image (read: OS.dmg). Also, with AutoCasperNBI the OS versions do not have to match. 10.7+ NBI’s can be created on 10.9+ Macs running AutoCasperNBI. NOTE: Only use Composer in the case of forked builds. That is when Apple releases a “fork” of the OS for a new iteration of hardware. If you have any issues in setting this far, the following (despite it’s age) is still the best resource to help you in “Troubleshooting the NetBoot process.” Apple also has some documentation available. Also, enabling verbose booting on a client can show where in the process things are failing & there can be issues with non-Apple Thunderbolt or USB adaptors as well as model filtering on the NBI’s too. Lastly, if you are creating NBI’s in an environment where packages used in the imaging process are hosted on a JDS instance, then you will also need to create an AFP share as outlined here. On Launch, AutoCasperNBI’s opens with most options are greyed out, this is by design. On selecting either, AutoCasperNBI will attempt to get their respective version details. Once you the version details have been found, the other options will become available. With both an OS.dmg & Casper Imaging.app selected, the rest of the main window will become available. The NetBoot Name field will auto populate, in the format of “<OS Version> AutoCasperNBI”, the “NetBoot Image Index” will be set to a random number & the “Serve Image over” options will be shown. If you now click “Build”, & AutoCasperNBI will start the NBI creation process. To skip to the build part of this guide, click here. If you wish to have Casper Imaging auto-populated with a JSS’s details, then enter the full JSS URL in the JSS URL text field. AutoCasperNBI will try & retrieve the version of the given JSS & will check it’s version against that of the version of Casper Imaging selected earlier. If there is a minor version difference (for example: 9.1 & 9.2), the AutoCasperNBI will reflect that in it’s wording in the JSS URL box as well as change the indicators on the Casper Imaging & JSS icons to yellow. Likewise if there is a major version difference (for example: 8.x & 9.x), these indicators will show be red & the wording will warn accordingly. The rationale is that you may wish to try different minor releases of Casper Imaging when tracking down an imaging issue. You may also wish to build NBI’s with in advance of performing a major version JSS update. However, it’s strongly recommend to not put into production NBI’s with major version differences between Casper Imaging & JSS. NOTE: If you enter a JSS URL, this is written to AutoCasperNBI’s plist for when you next run AutoCasperNBI. If uploading to a NetSUS, this name cannot contain a space & by enabling “Will be served from a NetSUS appliance” should remove any spaces you have. A NetBoot Images Index (alongside it’s name) is used to identify the NBI to clients & server. If this NBI is to be hosted on only one server, then the image index will need to be a value between 1-4095. But, if you’re load-balancing the NBI by hosting it on more than one server you’ll need to set a value between 4096-65535. The value of the index is randomly determined by AutoCasperNBI & is dependent on whether the “Will be served from more than one server” checkbox is enabling. Depending on your environment, one option may work better than the other. You can select which option to set in the NBI here. NOTE: The selections made to “Will be served from a NetSUS appliance”, “Will be served from more than one server” & “Serve Image over” are written to AutoCasperNBI’s plist. Technically, you could just hit the build button & be on your way. But AutoCasperNBI can do much more & does several things in creating an NBI. Pressing the Options button will open a new tabbed window, each of the Tabs & the options within are discussed in detail below. Each option also has a Tool Tip which explain their function. When creating NetBoot images on 10.9-10.9.3, older macs would fail to NetBoot due to the kernel cache being over the 32MB limit they had set in TFTP. TFTP is used during the NetBoot boot process to download the kernel cache, & so older macs would fail to NetBoot. If a 10.9.x OS.dmg is selected, AutoCasperNBI will remove some unneeded extensions in order to generate a kernel cache that is below 32MB allowing older Macs to NetBoot. By happy coincidence deleting the same kernel extensions stops an prompt when creating a 10.9.x NBI on 10.10.x as they are unsigned. Ideally the NBI will boot straight into the root user with Casper Imaging running, therefore the Apple, iCloud & Diagnostics setup assistants are suppressed. AutoCasperNBI will always enable the root user & will auto login as root. The premise of using Casper Imaging is to semi-automate the imaging process, making it hands off from clicking Casper Imaging’s “Install” button. However, if you’re using Autorun data the imaging process can be fully automated. If a non-root account is used to login to the NBI, Casper Imaging will prompt every 5 minutes for administrative details, which will somewhat hamper the imaging process. The root users password is set to: netboot. If you wish to NOT have root login, you can add a PKG that deletes the file /etc/kcpassword. As the screen saver being activated can pause some processes, the screensaver is disabled for the root account. This plist can add “unwanted” items to the dock, so it’s removed. The root accounts dock is set to the below. The Casper Imaging.app selected earlier is copied into the /Applications folder of the NBI. A Launch Agent is installed which launches Casper Imaging once logged into the NBI. This can be helpful when troubleshooting issues with JAMF Support. If the version of Casper Imaging selected is one that has just been download from JAMFNation, it may still have the Quarantine Flag. AutoCasperNBI removes the flag if present. If you have entered a JSS URL, AutoCasperNBI will download the JSS’s CA cert to the NBI & on launch this cert will be added as a trusted root certificate. This will mean that the NBI will trust JDS connections without prompting to accept the cert, as the whole trust chain should be on the NBI. If a JSS URL is given, AutoCasperNBI will write to Casper Imaging’s plist to enable connection to a JSS with an invalid SSL cert. Casper Imaging can see a JSS’s certificate being as being invalid either due to them being self-signed, signed by a private CA or if the NBI’s time is not correct. Similar to the screen saver, App Nap is disabled in case an app is napped. Software Update is disabled as not needed on an NBI. Spotlight indexing can stop a volume from being unmounted, & so Spotlight is disabled. OSX, by default, will ask if you wish to use new disks for TimeMachine backups. This can get boring pretty fast when imaging macs, as you can see the prompt several times. So AutoCasperNBI disables the prompts. Gatekeeper is “disabled” by setting it to “Allow apps downloaded from anywhere.” This again stops any prompts from interfering with the imaging process. Disk Utilities Debug menu is enabled, giving access to some more detailed information which can be handy when troubleshooting. NBI’s used for Casper Imaging are required to be diskless, so that the booted Macs HD can be erased or partitioned as needed. The NBI is set to expand up to 64GB, this is to allow for more disk space to be created if needed by applications running on the NBI without expanding on the size used by the NBI. To save on disk space used by the NBI itself, the NBI is compacted at the end of the process, so this is after installing any extra Packages etc. Currently, NetSUS can only host NBI’s that end .dmg. As such, if the option “Will be served from a NetSUS appliance” is ticked then the NBI’s DMG is renamed. If selected, AutoCasperNBI will generate a description for the NBI that contains the OS.dmg’s OS & build versions, Casper Imaging’s version, the JSS URL (if supplied), the name of the user that created the NBI & the date of creation. Reducing the NBI’s size is not needed, really it’s not. NetBoot clients will only pull the data required to boot the OS, so starting with a clean OS.dmg will lower what the clients request. However, AutoCasperNBI can be used to reduce the size of the NBI by checking this box. The resulting DMG size will vary, but for 10.7-10.9 NBI’s it falls under 8GB, for 10.10 it’s around 8.7GB. This dmg will be named NetBoot.reduced.dmg & will be in the NBI folder. One last point to mention is that the default desktop is also removed when reducing the NBI, this results in a background like the following (note the below has had a custom dock deployed). One of the benefits of imaging via a NetBoot instead of a NetInstall is that you can remotely connect via screen sharing. This allows you to image macs that are either 1 desk, or 1,000 miles away & review the progress. Another benefit of NetBoot, is that you can perform some diagnostics when NetBooted, things like repairing permissions etc are possible as you’re not booted to the same volume you’re running the repair on. If you check “Enable ARD” the username & password you enter are written in plain text to AutoCasperNBI’s plist, but on the NBI itself they are encoded. When the NBI is started up, AutoCasperNBI’s launch daemon runs a script that will create a user with the username & password given & then enables ARD. /Library/Preferences/com.apple.VNCSettings.txt this password is obfuscated via a perl command. This password is again written to AutoCasperNBI’s plist. Checking this option will replace the default desktop located: /System/Library/CoreServices/DefaultDesktop.jpg with the image you supply. Nothing is done in regards to resizing etc, so bare that in mind with the image you set. The path to this image is written to AutoCasperNBI’s plist. On build AutoCasperNBI will check that the image exists, alerting if it cannot be found. NOTE: Anything set in this panel is written to AutoCasperNBI’s plist. Here you can set the NTP for the NBI to use as well as the timezone. The “Time Zone” pop up includes the main locations for setting timezones on OSX, it’s not the complete list, but it’s the primary ones. You should be able to find a location appropriate for the timezone you wish to set. From the “NetBoot Language” pop up includes a list of OSX’s “tier 1 languages” (to quote Apple), the “Input Language” pop up includes all of OSX’s supported input languages. When this option is checked, AutoCasperNBI will create a second ASR’d read-only DMG in the NBI folder. This read-only DMG can then be restored to external media, such as a USB stick. This gives you a portable OS from which you can image. By default, NetBoot servers starts to stop allowing clients to boot from them after the 10th or so client has booted. For several years people have used the following guidance from the University of Utah to modify the rc.netboot file to allow more than 10 clients to boot. Checking this option replaces the NBI’s standard rc.netboot file with a modified version of the above linked example & was supplied by foigus. In the beta, one tester managed to boot 35 clients from a single NetBoot server after having replaced the rc.netboot. YMMV however. Simple Finder is a stripped down, simplified version of the Finder. Checking this enables Simple Finder, which results in the Finder behaving such as what’s mentioned here. When the NBI is started up, AutoCasperNBI’s launch daemon runs a script that trust as root any certificates found in this location. Packages added here, are installed onto the NBI after any items are deleting off the NBI (if reducing), but before the final NetBoot.dmg is created. On launch & pre-build AutoCasperNBI checks that the selected certificates &/or packages exist. If any certificates &/or packages cannot be found when the build button is pressed, you’ll receive an alert & the build will stop. Any that are missing are shown in red under the “Additionals” tab. If they are missing as you’ve not connect some removable media they were on, reconnect the media & then click the refresh button. AutoCasperNBI will again check that the items exist & in finding them, will change the text to black. Administrative privileges are required by AutoCasperNBI in order to build the NBI without prompting for permissions every 5 minutes as per sudoers 5 minute timeout. AutoCasperNBI caches the entered username & password to variables within AutoCasperNBI & they are not written anywhere. For 10.7-10.10 the PlatformSupport.plist found at: /System/Library/CoreServices/PlatformSupport.plist is used to generate the “DisableSystemIdentifiers” array in the NBImageInfo.plist. 10.11’s PlatformSupport.plist can also be found at: /System/Library/CoreServices/PlatformSupport.plist. But on 10.11 it only contains “SupportedBoardIDs” & not the “SupportedModelProperties” needed to model filter on NetBoot servers such as BSDPy. When generating a NBI on 10.11 via SIU a private framework included within 10.11 is called to resolve the “SupportedBoardIDs” to “SupportedModelProperties”. However, as AutoCasperNBI & AutoImagrNBI allow for the creation of 10.7+ NBI’s on 10.9+ this private framework cannot be used by either AutoCasperNBI & AutoImagrNBI. If an OS.dmg is selected for a build that does not have an NBImageInfo.plist within AutoCasperNBI or AutoImagrNBI, then AutoCasperNBI or AutoImagrNBI will attempt to download the missing NBImageInfo.plist from here. On clicking “Build” AutoCasperNBI will ask for the location to create the NBI’s enclosing folder. With a location selected, AutoCasperNBI checks to make sure there is enough space available to create the NBI. AutoCasperNBI reads the used space on the OS.dmg, rounds up the used space & then checks the destination to see if we have enough space, erroring if not. Once all checks have passed, AutoCasperNBI will close it’s windows & show the progress bar shown above. This gives visible feedback as to the builds progress. The contents of OS.dmg are copied to a new DMG within the NBI folder. (Well a sparse image which is then renamed dmg). You may see AutoCasperNBI show as “not responding” during the NBI creation, this is normal & a side affect of writing an app in AppleScript as it’s not able to multiple thread. During these “hangs” the cogs animation will continue, just leave AutoCasperNBI to do it’s thing. The NBI creation can take upto 20 minutes on a Mac with an SSD, to 90 minutes if running on a spinning disk. The main window should reappear. OSX’s complete notification will sound. The progress window will look like the below. Whilst AutoCasperNBI creates a Read-Write sparseimage, this is renamed from NetBoot.sparseimage to NetBoot.dmg to make sure the resultant NBI is compatible with not only OS X’s NetInstall service, but also BSDPy & NetSUS. If you wish to make the NBI Read-Write again, rename to NetBoot.sparseimage. Make your changes then rename back to NetBoot.dmg. AutoCasperNBI writes it’s logs to ~/Library/Logs/AutoCasperNBI/. These can be quite verbose, but are handy if you need to troubleshoot why AutoCasperNBI is failing to create the NBI or if you just wish to have a nose at what it’s doing. If you do have any issues, please log them here. You are taken to the same page when you select Help > Log An Issue from the menu bar. The log can also be accessed when the build has completed or failed by clicking the “Open Log” button. AutoCasperNBI checks for updates once a day, if an update is found you’ll will be asked to update. You can also manually check for updates by clicking AutoCasperNBI > Check For Updates.. from the menubar. With any software, there is bound to be some issues. For known issues please see AutoCasperNBI’s read me, to log an issue please visit this page. AutoCasperNBI & Casper NetInstall Creator leverage the same methods to create NetBoot & NetInstall images as System Image Utility. Hello Ben, awesome presentation at JNUC! What a way to wrap up the conference. Silly question but what am I missing here when I try to get this started. No .app file to kick it off? There is a download link at the top of the post, that will download AutoCasperNBI.app. When creating a NBI, it is best to create it on the latest Apple hardware you have, correct? Or does it matter which computer you create it on just as long as you have the latest OS installed? I created a NBI file using this utility this morning on a MacBook Pro (Late 2013) I went and tried to NetBoot a computer that is a MacBook Pro (Mid 2014) and it would not netboot but other older computers could. Thoughts? Thanks so much for this tool!!!! Shouldn’t matter about hardware. OS version of NBI will matter. Were you creating an 10.9.5 NBI which was created using the 10.9.5 Install OSX Mavericks.app? I was actually creating a 10.10 NBI from the Install OS X Yosemite.app. I used AutoDMG to make the dmg and used that dmg in AutoCasper NBI. I have had very mixed results with the NBI file. Sometimes it will netboot on machines and sometimes it will not. I can not find a common ground. I made a read only dmg with the NBI and I have restored it on a USB drive and that seems to be working well. I have all of the verbose data just didn’t know if I could give it to you all to see if it was something I was doing. Thanks! Sure I can try, thing is.. Each NetBoot envrionment is different. But things to try are changing from HTTP to NFS (& vice versa), as well as not reducing the image or not toggling rc.netboot. Hi Ben: great presentation at JNUC. This is an great tool you’ve made. Thanks. As per the talk, there’s been some lovely collaboration on it. Happy it’s working out. Haha. This is something that I realised @ JNUC is really needed. Please contribute there, & we’ll figure it out & add it at some point. Just played around with AutoCasperNBI during CCA, worked! A feature request: the possiblitiy to select applications which will be added to the dock when netbooted. The idea is that you can customise the Dock as you wish via a PKG, only as we all do it differently. Is it possible to add an application to the startup items like you do for Casper Imaging within the NetBoot image? So when I enter the netboot image the application I want opens up? Sure.. The LaunchAgent that loads Casper Imaging can be found at: /Library/LaunchAgents/com.AutoCasperNBI.CasperImaging.plist. You should be able to create your own launch agents to launch any wanted apps or even remove that launch agent, then add that as a pkg to AutoCasperNBI. I think, similar to the last post, that the idea is you could do this via a package. That’s what I did. I created a package that installs an app that we use to simplify erasing FileVault-encrypted volumes. However, I believe you have to manually remove/modify the existing launchdaemon that auto-loads Casper Imaging, but that’s a trivial process. That part I don’t think can occur in a package (at least in my testing) because I think that the package that you add to your workflow will run before the final launchdaemon gets put in place. When I tried to install a new .plist file into /Library/LaunchAgents via a package, it looked like it got overwritten by the version installed by the app onto the NetBoot image. Question: Autodmg makes read only disk images, and I have validated this by looking at the shell script that is a part of autodmg and by mounting an image I have made with it and confirmed I cannot write to it. This proves to be problematic when its time to update Casper Imaging in the netboot volume after a casper upgrade: https://jamfnation.jamfsoftware.com/article.html?id=67, i have tried using disk utility and hdiutil to convert to writable images but have not had success. Any suggestions on working through this? I would hate to rebuild the netboot set everytime we upgrade the JSS as we have to do a lot of customizations. AutoCasperNBI doesn’t create read-only images unless you click the checkbox to do so. While you can use an AutoDMG-created base image as part of an AutoCasperNBI workflow, that does not mean that the resulting NetBoot image becomes read-only. I know because I modify my NetBoot images created with this app by removing the launchagent that auto-launches Casper Imaging and replacing it with one that auto-launches another app. Also, I have successfully updated Casper Imaging.app after the fact too. Interesting, I am not checking the box, but the netboot image I create when I mount it doesn’t let me write to it and the ACL shows that I have read/write permissions to it. I need to rename the read-only button, DMG’s created with that ARE read-only & are ASR’d for restoring to removable media. The finished DMG otherwise should have the same perms as an NBI created with SIU. New versions of Casper Imaging should be able to be dropped into the Applications folder, replacing the older version. Ben, what is the contents of your package that configures the Dock? I would like to add a few things like Disk Utility back to it and I was wondering if I could do it by mounting the NBI image on the NetBoot server and copying in a specific plist for the Dock. Nevermind, I found it. I mounted the drive, pulled it into Go>Go to Folder, then added /private/var/root/Library/Preferences/. Opened right up. I did have to change the permissions to allow Everyone to Read. Thanks for the great product, Ben! Cool you beat me to it! All I get is “Cannot read OS Version” when I try to load any DMG into it. Two were created with Composer, and one is the InstallESD image from Yosemite installer app. That issue should have been fixed in them. It didn’t work, but thanks. Same error? I’ve been testing with Composer captured OS’s & made changes that work for me. Can you post a an issue to https://github.com/macmule/AutoCasperNBI/issues with the log file? I can’t help with the little information given. I submitted an issue with a screen shot. The behavior is now different with AutoCasperNBI 1.1.7. However, I tried netbooting to the NBI, and it worked. I didn’t run Casper Imaging, though. I deleted that NBI, and going to try again today. I am trying to the pre-release bits with a untouched MBA early 2015 7,2(I think) os.dmg I created. The AutoCasperMBI has been stuck on “Today’s Log: …….AutoCasperNBI-2015-04-09” for many hours. Have rebooted my machine and started over twice. Idea? So, what does the log say? If I choose the “Simple Finder” option, do I get a choice of which apps I can put on the Dock? Great job Ben! Is this the best place to submit feature requests? I’m primarily using the tool to create imaging boot drives. 1) Tbh that’s one of the functions we use the additional PKG’s for. We create the Dock as we want & install this dock via a PKG. 2) Can you expand upon this request. Thanks Ben, at the pre-boot menu the restored DMG shows the display name “EFI Boot”. It would be nice to use a customizable name there. Also could be deployed via additional pkg. Not a necessity, but a “nice to have” in the gui. Oh so EFI Boot from a USB etc? hmm.. ok.. Not sure how or where that’s set.. If you can find it can you log it as an issue on github with a link to where that’s set? The dock is a can o’ worms & alot of effort.. so might avoid that. I am unable to write to the NetBoot.dmg inside the NBI folder now to add a customized Dock plist. It is telling me I have Read Only permissions. I created the image using AutoDMG, then went through the specific steps to setup the NBI using AutoCasperNBI. Is there something I’m missing or need to change to be able to add my own Dock? Or, is creating a PKG and adding that to the NBI creation the best way? Thanks! PKG would be the preferred way. But you might be able to rename the “NetBoot.dmg” to “NetBoot.sparseimage” & then you should be able to modify it as needed. Hi there, Can you update this process for El Capitan 10.11 and the New MacOS Sierra 10.12. I have built a Netboot server and built many images but they are all massive in size. Largest came out to 32GBs and the smallest 6GBs which both errors out. The smallest one that works to boot from is about 13GBs. However after kicking off 25 systems out of that only 2 get to the login screen then takes forever to get Casper Imaging open and started. Or has anyone found away to get Casper Imaging injected into Mac Recovery so it can be used as a bypass to the Netboot server altogether? Spent 3 weeks getting Netboot setup and configured and almost 3 months to have a crappy image that barely works. This works with 10.12 just fine. Something else must be amiss. Can you join the macadmins.org slack & then the #netboot channel within? I’ll be there & others will to help further. I’ve created a 10.12.2 NBI image using AutocasperNBI and uploaded it to the netsus server. When I try to load the netboot image it gets past the world icon stage to the progress bar. At the progress bar it stops at around 75% and does not move past there. I’ve followed exactly the same process I used when I made osx 10.11.x the netboot image and previous version. Have you come across this problem before? If you have are you able to recommend any fixes. Are you on the macadmins.org Slack? (if not.. please join). Then pop into #netboot. Plenty of folks there, myself included, that can help better than the comments here. is it possible to create a .nbi of a linux distro like ubuntu in order to install via netbook on a old macbook pro (3,1) ? I’m having an issue with macOS Sierra NBI’s created with v. 1.4.1. Disk Utility in the NetBoot OS seems to not work. It just can’t erase the target drive. I tried NBI’s based on macOS Sierra builds 16G29, 16G1036, and 16G1408. I get the same behavior in all of them.